My very first DIY mod on the CB400X – wiring up for USB power! Now, I’m super-dependent on my mobile phone (who isn’t these days??). My iPhone 8 is not only my communications device, but also my GPS navigator. With the screen kept on and GPS active, it takes a huge toll on the phone’s battery. Ideally, it should be hooked up to a USB power source to keep the battery charged. I’m still awaiting for some other electronic accessories to arrive via mail order. Meanwhile, I’ll need to keep my iPhone happy. So I did some research on how best to tap a 12V source only when the ignition is turned on. 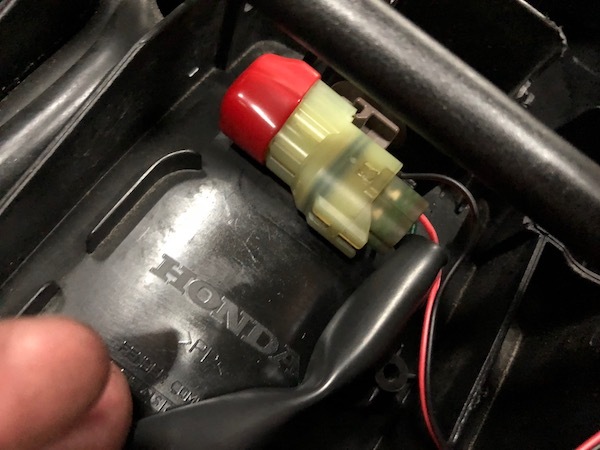 Turns out that Honda has an Options Plug tucked neatly underneath the seat which provides a source of 12V (always on) and 12V (only available when ignition is on). Perfect! 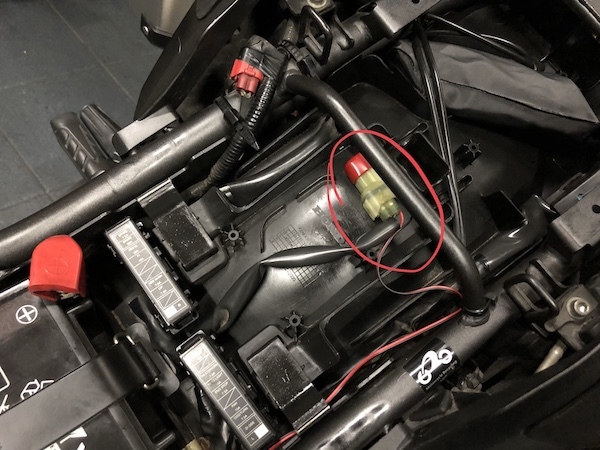 Location of the Options Plug where a 12V (ignition on) source can be tapped. The Honda under-seat Options Plug closed up. 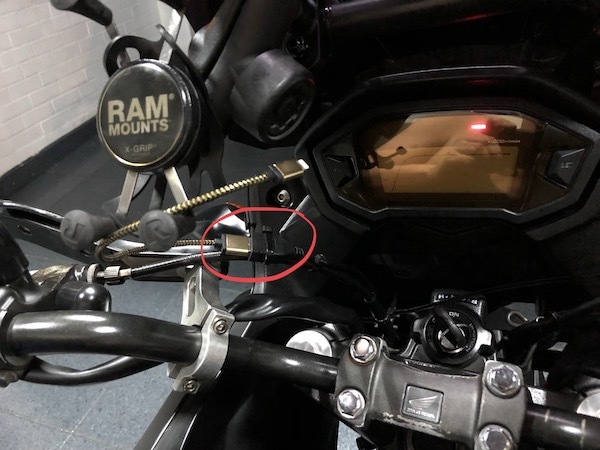 And so I popped opened the connector, slotted in the USB power wiring, routed it along the side panel, secured it with loads of cable tie, and routed the USB socket to the handlebar area. Ta-da! Now my iPhone 8 should be kept happy! This is a quick and dirty way of tapping power. But until I receive the rest of my electronic accessories, I will then do a proper relay-switched power with a fused distribution box setup – something similar to what I did for my Pulsar. Hi bro, i was just reading your post with great anticipation, but what you have just went thru with the engine oil thing is small issue, but just a word of caution with regards to oil weight,odern engine have tight tolerances and upping the grade viscosity might not assist in lubrication, but rather hinder the flow heat transfer and lubrication. Best option is use the best EO you can find, and shorter oil change interval, even better, send your used oil for a oil analysis, it can tell your engine state of health, from coolent leak, to overheating, bearing wear, and even life remaining for the oil. I do that for my car to determine if the oil suits my driving style too. 1) The previous oil (and I’m assuming for all the oil changes) the previous owner used was a 20W50. I am cautiously stepping down the viscosity to 10W40, before attempting the 10W30. I don’t know the real reason why the other guy (or his mechanic) has chosen to go with 20W50, but if it were due to oil consumption, a jump down 2 grades to 10W30 will likely exacerbate the situation. 2) Singapore’s weather hover around 32degC or so round the year. I’ve seen some SAE charts that seem to suggest 10W40 being more suitable to engines running around this ambient temperature. Some charts seem to suggest that the thinner 10W30 should run in a max ambient temperature of 30degC. Anyway, sticking to Mobil 1 10W40 fully synthetic (JASO MA2, API SH) should be pretty safe for now. And I’ll continue to monitor for any abnormal oil consumption.